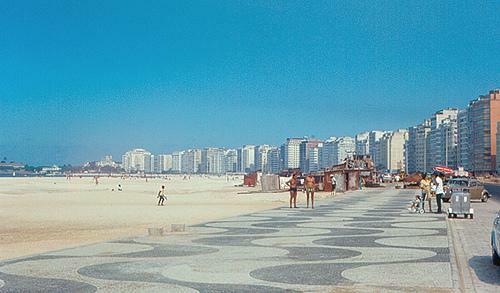 Avenida Atlantica is a 4 km long seaside stretch alongside Copacabana beach, spanning the entire length of the neighbourhoods of Copacabana and Leme. Avenida Atlantica is a 4 km long seaside stretch alongside Copacabana beach, spanning the entire length of the neighbourhoods of Copacabana and Leme. It is flanked by military bases - Forte de Copacabana in Copacabana, and Forte Duque de Caxias in Leme. The avenue has 2 car lanes, a bicycle lane and a promenade, famous for its geomotric wave-shaped mosaics. The area is lined with numerous buildings, restaurants and cafes.